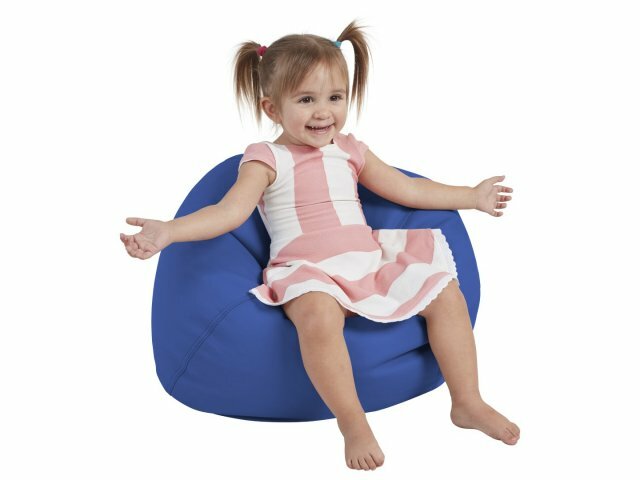 Your little ones will appreciate having this cozy toddler bean bag to curl up on, when they are feeling like they need a moment to themselves. If comfort is your goal, children's bean bag chairs from ECR4Kids will make the perfect addition to your learning space. Their cozy and inviting design is perfect for media centers, classrooms, lounge areas, and more. The reinforced phthalate-free polyurethane cover comes in an attractive selection of colors, and can easily be wiped down with a soap and water solution. These bean bag chairs for kids are constructed for years of use and love. The double-stitched seams and two child-proof locking zippers are ready for constant enjoyment. Whether they are settling down with a book, calming down in the middle of a hectic day, or enjoying an informal study session, this kids bean bag chair is sure to become a fast favorite among your students. Healthy Material: Reinforced phthalate-free polyurethane upholstery comes in a selection of hues. Kid Proof: Two child-proof locking zippers ensure that little ones cannot open the cover. Sturdy Construction: Double-stitched seams ensure bean bags will stand up to long-term use. Low Maintenance: Wipes clean with a soft cloth, and mild soap and water solution.